Charles is referring to something trade named "Oilite", a porous bronze bearing material. It is something like a bronze sponge. Oil from a wick and reservoir or a felt ring, is transferred to and through the Oilite bearing to the shaft surface. It maintains lubrication where needed, for much longer periods than plain bronze bearings. Over the years, old types of oil, coupled with lack of lubrication, can prevent oil flow. That is when they need to be thoroughly washed out and re lubricated. Oil for them, never grease. By the way, have you checked it with a Kill A Watt meter? If it is within the amperage draw stated on its data plate, it should be fine and dandy. Use a spring hook to probe that slot. I've seen some bearings that have a slot cut through them as you describe, and the flat wick pokes through the slot and touches the rotor shaft. With the spring hook, you might be able to feel if there's a wick in that slot. .
And yes, clean off that grease. It'll only cause problems long term. Yes, Lane, I believe there were wicks in the slots. What if anything is the maintenance procedure for those? Another question: where can I get an extension tube for my blue 3 in one oil can. I'd like to be able to oil this fan as needed without removing it from the window each time. Ok. So if there is some sort of reservoir behind the bearing that feeds the wick, how often would you think it needs to be filled? Our original fan that started all this way back in my childhood probably was lucky if it got oiled once a year. I don't really know. Now I'm thinking I should take it apart, clean with acetone and then somehow verify that oil is seeping out through those wicks. Yes? The hot running and sluggish start went along with immediate stopping also. And I was oiling a few drops at the oiling points. After the light grease, it ran much cooler and better. So maybe the oil wasn't getting to where it needed to get. If it only needs to be oiled a couple times a season, I really don't need an extension tube. Sorry Jeff, I missed your post. If the bearings and wick don't seem too gunked up, what I do is just clean the part of the wick that penetrates through the bearing with lacquer thinner and a q tip. Keep cleaning until it's fairly clean. I can't recall exactly how your fan is built but some have a bearing plate that's riveted to the motor end plates. You could certainly drill them out and soak the felt. ( usually it's a felt donut). However I've found that many of these fans without oil cups were woefully under- oiled, which while terrible for the bearings, helped the felt donuts to remain like new, and not gunked up. If they look decent, I'd just clean the felt where it touches the shaft, and recoil it. Maybe you could post pics of that area of your motor so we can get a better look. I use zoom spout oil which has the long tube. You can get it on Amazon. Or, I usually have it at the Northeast meets. Well... everything was cool for a couple years. But now my Robbins & Myers B3400 is having problems. It just started bogged down and vibrated a little. There is a faint sparking sound and the amp meter goes from about 1.5 amps to about 1.8 amps. This is intermittent on low speed. High speed is worse. I'm looking for advice and also for a spare motor or another Robbins & Myers window fan. Before you start looking for a new motor, I would look into the capacitor. These can go bad and make motors do weird things and it would be best to replace it to prevent damage to the motor. There is one exactly like this but it is under Hunter which I think originaly made these fans. Rob Duffy wrote: Before you start looking for a new motor, I would look into the capacitor. These can go bad and make motors do weird things and it would be best to replace it to prevent damage to the motor. The capacitor will make an arcing noise when it is failing. It can then go on to ruin the motor. 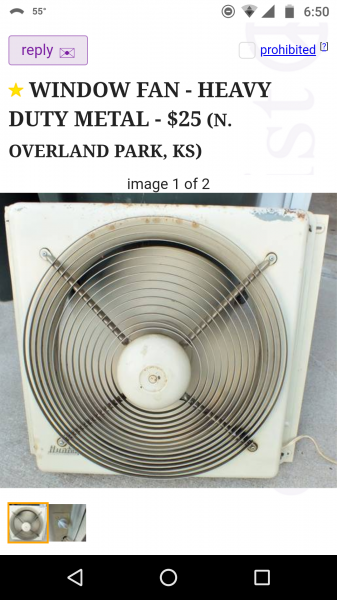 Please replace it and I bet your fan is like new again! If the cap looks bulged or leaky replace it. Where can I find a replacement capacitor for this fan? Page processed in 0.2890 seconds (49% database + 51% PHP). 28 queries executed.